A few thoughts on what I’d like to see from Canada to complete the barrage of posts prior to kick off. Much of the rhetoric pre-match involved taking qualification one match at a time, while that is generally true – and clichéd – it would be folly to do so for these two matches. You can bet Panama will be looking at this home-and-home series as just that and Canada should do the same. Stephen Hart is a cautious coach, but this first match is the chance to firmly establish one foot into the next round and to sit back, hoping for the result rather than going for it, is a dangerous tact. Panama would be more than happy to take a draw back home for Tuesday’s rematch. With that in mind here is the lineup I would like to see, explanations will follow. There are so many players I want to jam onto the pitch; the difficulty with Canada is finding balance with so many options in midfield, yet very few that mesh well together. With the glut of midfielders, most of them central, it’s difficult to find the width necessary to take advantage of Olivier Occean’s ability in the middle - the same problem likely plagued Rob Friend’s international career, but let’s leave that to the side. That’s why Josh Simpson is such a valuable asset to this team and his absence is so marked. Simeon Jackson’s pace caused Panama trouble at the Gold Cup and his threat could pin left-back Luis Henriquez – a dangerous attacking weapon – back, negating some of Panama’s width, and allowing David Edgar to move forward. His ability to play inside-out and outside-in will occupy much of that quadrant on the pitch. Occean is likely the most clinical finisher on the side and is confident; get him in there. I would give Dwayne De Rosario the first half in the middle of the pitch, to make something happen early, then shuttle him back out to the flank or replace him with Tosaint Ricketts to inject some fresh pace and revert to a more simple 4-3-3. The freedom to move about and find space is what De Rosario is best at. It’s no wonder that he created Canada’s penalty kick the last time the sides met through the middle – he dished off to Julian de Guzman on the right, charged into the box as de Guzman send a cross to Simpson at the back-post, and was fouled when Simpson’s header back into the middle appeared dangerous. 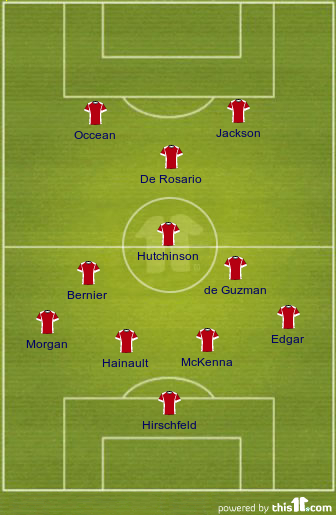 I would start Patrice Bernier, Julian de Guzman, and Atiba Hutchinson in the middle of the park – may as well put your best foot forward here and hold Terry Dunfield and Will Johnson back until the sixty-minute mark to – hopefully - protect the advantage and freshen up the middle if need be. Resting at least one of those two in preparation for the second leg wouldn’t be a bad idea, as I gather their energy in the middle will be required in Panama. That being said, Nik Ledgerwood put in a very good performance against the Americans and adds freshness that none of those three possess. It’s hard to leave him out – how many subs do you get again? The three-man shield contains many of Canada’s best players; intelligent, defensively aware, able to get forward or pick a devastating pass. Their savvy in the middle should protect the back-line, while also supporting the attack on a rotational basis. Their awareness will, again hopefully, allow the full-backs to get forward and provide much needed width to the narrow structure. Left-back is where things get interesting – and the theories get crazier. Ante Jazic is a sound defensive option – and most likely who Hart will field - but I would rather he played in Panama and someone with more attacking impetus – Marcel de Jong or even Ashtone Morgan - was stationed there. The home field aspect of the match should not be overlooked. It’s true, there is a good chance that international action may well be a little beyond Morgan at this moment – and this may be entirely a homer pick - but surely some comfort will be had from playing in a familiar setting, in front of the home fans, combined with his youthful exuberance, is of some value. It will be a bit of a gamble, perhaps forcing Hart to burn an early sub if he can’t handle it; but his ability to get up that flank and provide steady service will cause Panama all sorts of bother and – again – provide that much need width that the narrow attack needs. That way Jazic can be saved for Tuesday and a little bit more width can be added to what is a very narrow formation. David Edgar has looked very good at right-back, particularly his service into the box. If I was a betting man, putting money on an Edgar cross from the right to Occean at the back-post is a solid bet – worked in Cuba. No debate about keepers; none is what I want, but all will do. Go get them Lars – I meant the points, don’t be wandering about. I expect Panama to be very conservative in their approach, looking to hold off the Canadians and look for a gap to expose. If Canada plays the same counterattack-minded game, another 0-0 stalemate would not be unexpected. In summary - three subs: Ricketts on for De Rosario after a good shift, one - or two – of Dunfield, Johnson, or Ledgerwood into the midfield for any tired legs after a good sixty minutes, leaving one remaining sub for any unexpected injuries or if Morgan struggles. It looks a very defensive structure, with numbers amassed at the back, but with three central midfielders, each capable of getting involved and full-backs freed to get forward it could just work. The return leg of the series will require much more defensive nous and likely a different lineup, possibly one without De Rosario entirely and most likely without Bernier. Fresh legs from Jazic, Ricketts, Johnson, Ledgerwood, and Dunfield – spared from a full match in the proposed formation – could make all the difference in keeping the match tight, closing down, and harrying the Panamanians who will be more adventurous at home. This was originally intended to be part of the preview over at Waking the Red, but I have a tendency to ramble on, so figured I'd turn it into a separate post.